Welcome to Fuchs Cottage. This gracious Victorian home, on a secluded, six-acre hillside in Stonington, enjoys views of the Deer Isle Thorofare and the islands of the Western Bay beyond. 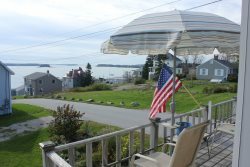 Take a walk along the path to the shore, go for a stroll through Stonington village where you'll find excellent restaurants, art galleries, live theater, shops and the ferry landing for the mail boat to Isle Au haut, or just relax and take in the beauty from the covered porch. Fuchs Cottage has old-country charm while providing modern conveniences including wireless internet, satellite television, telephone, washer/dryer and a wood-burning stove for those cool September evenings. The home maintains many of its original details including hardwood floors, turn-of-the-last-century chandeliers and a tin ceiling in the living room. All of the home's common areas are on the first floor. There's a large kitchen with table space for breakfast, a formal dining room for those lobster dinners, a bathroom with a shower and washer/dryer, and a comfortable living room with views south across the water to Isle Au Haut. The second floor of Fuchs Cottage has three large bedrooms. The master bedroom has a queen bed and has grand views of the water, a large closet and a dresser. The second bedroom has a full bed and a twin bed, a closet and dresser. The third bedroom has a full bed, closet and dresser. On this floor there is a bathroom with a claw-foot tub to soak in. Fuchs Cottage has a large landscaped yard with grassy lawns, perennial flowers, blueberry bushes, and a path which leads to the shore less than five minutes away, where you can keep your sea kayak, have a picnic and paint or photograph to your hearts content. Come and spend a week or more at this classic, oceanfront home in Stonington.